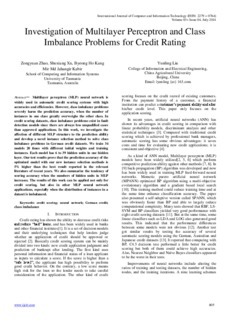 Multilayer perceptron (MLP) neural network is widely used in automatic credit scoring systems with high accuracies and efficiencies. However, class imbalance problems severely harm the prediction accuracy, when the number of instances in one class greatly overweighs the other class. In credit scoring datasets, class imbalance problems exist in fault detection models since there are always less unqualified cases than approved applications. In this work, we investigate the affection of different MLP structure to the prediction ability and develop a novel instance selection method to solve class imbalance problems in German credit datasets. We train 34 models 20 times with different initial weights and training instances. Each model has 6 to 39 hidden units in one hidden layer. Our test results prove that the prediction accuracy of the optimized model with our new instance selection methods is 5% higher than the best result reported in the relevant literature of recent years. We also summarize the tendency of scoring accuracy when the numbers of hidden units in MLP increases. The results of this work can be applied not only for credit scoring, but also in other MLP neural network applications, especially when the distribution of instances in a dataset is imbalanced.